Characters Always Drive the Story — So Say We All! 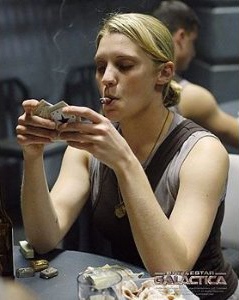 Starbuck (Katie Sackhoff) smoking a cigar in Battlestar Galactica. I’ve noticed that writers, when discussing the process of writing, often (maybe even always?) describe their work as “character-driven” as opposed to, I assume, “plot-driven.” I’ve made this mistake, too, without even thinking about it. I’ve caught myself telling writers, while editing, that they’re too excited about the plot twists and not excited enough about the characters experiencing the plot when in reality they should be paying equal attention to both. But I get why we’ve developed this natural antipathy to overly plotted entertainments. We’ve become somewhat beaten up by bad writing that gains wide acceptance simply because of the “gotta find out what happens next” factor at the expense of everything else. People – avid readers especially – get tired of it. The worst offender here could be the pop serial and its necessary gimmicks. Ask any superhero comics writer for advice and they will tell you to spend 21 pages resolving the previous issue’s cliffhanger while also building towards the new cliffhanger on Page 22, leaving readers on the hook for another month in a never-ending cycle. The first job of a serialized storyteller is to get people to come back next time, which can read to literary types as an imbalanced list of priorities. Serialized action-based narratives gave birth to single-chapter versions (or fewer-chapter versions), popularized by the likes of George Lucas, Robert Ludlum, Ian Fleming, and on and on, becoming widespread and extremely noticeable.